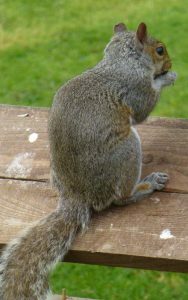 I have a soft spot for grey squirrels – we had an entire family of them in our garden many years ago and the baby squirrels were adorable. Not so keen on deer, which eat most of our young plants and, I suspect, brought in the ticks into the garden that led to the death of our dog. Squirrels are okay but Bambi need not apply for sanctuary here. Carol, three cheers, another supporter of grey squirrels! And young ones of almost any wild species are such fun…except, clearly, deer. I must say having deer at the bottom of your garden sounds rather exotic, but I can imagine they are a real pain. I wonder what the game laws are in your neck of the woods…venison is quite tasty, isn’t it? Oh dear, better not pursue that train of thought of I’ll upset all the Bambi fans! 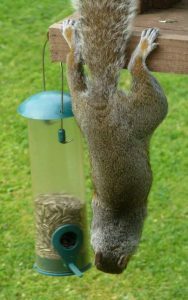 Ruth, after enjoying your latest cat-centred blog post, I’m thinking of enlisting some squirrel input for my next book launch! Agreed! I know there are people who refer to them as “rats with bushy tails” but they’re very entertaining to watch.